So you have a front and back garden, like me, Terra ? Most of my front garden is around to the right of this photo... towards the road... Nice that the front door doesn't face the road ... Is yours a similar layout ? 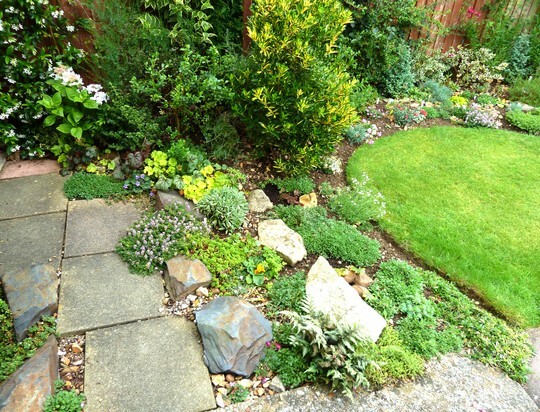 TT, I think you should move closer to me in Surrey and come help me create a beautiful front garden like yours. Seriously jealous. I like the way those alpine-y things creep over the path. So pretty. Thanks... we are all packing our bags ..
Terra, my front is enclosed by hedging and tall shrubs, i'm in a private (and very quiet) road (cul-de-sac) so not much traffic noise. I have a double fronted house so the garden's the width of it, has a central path and the whole garden's on show. The back is equally as quiet, and all infront as you look at it - i'm making both gardens 'meander' so that everything isn't viewed at once. It looks really lovely x.
Louise... your garden design sounds lovely..
Lovely TT - very green! That's a lovely view you've got there TT. Nice to see that from your front door. Hywel ... all okay ..
comment only came out once .. ;o) Lol. Hi Bloomer .. Thanks ..
A very pretty front garden TT, with some very interesting planting. Love it. This is the sort of construction I would like: steps down onto the lawn through a large rockery. I can only dream.... Really nice and its lovely to see those blue slate stones. These are the only ones I use on my rasied beds: the colour of the stones contrasts with all the plants and they look great when they are wet. What a pretty garden you have Terra. Would love my garden to look like this. Hope my rock garden looks as good when it finally gets finished. I love the fragrance and flowers of Trachelospermum jasminoides! (I almost want to eat the flowers because they smell so good. lol!) I have one...and it's a very widely grown vine here. I'm sure your rock garden will be lovely .. The stones have natural colour ..
Have you put a pic on GoY of your flowering Saponaria ?